We’re now entering the Agatha Christie phase of the coalition negotiations, given that all the main characters have been summoned to the drawing room today by M. Hercule Peters. Although the resolution of the plot will take a few days yet, one can bet that all be finally executed with brilliant elan by Monsieur Peters. All will ultimately be portrayed as having been the only conclusion possible for the discerning mind, no matter that the voter ordinaire will be kept guessing right up until the final unveiling. That’s just how it’s done. Yet even now perhaps, we can dare to surmise as to where this particular mystery is headed. Theoretically, there are many, many options. Peters has claimed to see nine of them. Yet only four are really in play: formal coalitions with red or blue, or a future for New Zealand First on the cross benches, after granting confidence and supply to either Labour or National. The tight timeframe to resolve these options seems highly significant. Peters waited until today to begin talking and he’s waiting for Saturday’s special votes tally before he begins talking in earnest. Yet only five days later, he’ll reveal his final choice as to who will govern this country for the next three years. Clearly, that doesn’t leave time for any line-by-line policy horse trading, or for hammering out the sort of long, detailed and prescriptive coalition agreement that Peters demanded after the 1996 election. If policy issues can be set (somewhat) to one side, a formal coalition with National would (a) create a bigger margin for passing legislation and (b) be cleaner to manage, in that only one other partner would be involved. Roles for Peters could readily be arranged: Attorney-General (plus knighthood) and Foreign Minister, and Deputy Prime Minister. Cabinet posts also for Ron Mark (Defence) Tracey Martin (Education, which would mean good bye to charter schools and national standards) and Shane Jones (Maori Affairs.) Sure, similar gains could be conceded by Labour. Yet (a) the Labour/NZF/Greens triumvirate would have a very narrow margin in Parliament for legislation, and (b) even if the Greens were left outside the formal coalition tent, their confidence and supply position would still give them an effective veto power on any major legislation. True, that would be a nuclear option that the Greens would be loath to invoke – they would justly be blamed for bringing down the government – but the spectre would still be there. All things considered, while it’s not impossible for Peters to go centre-left, it seems less likely. So to my mind – and this is only a wild guess – the likely options are between a formal coalition with National, or a confidence and supply deal with National. Yes, that outcome would disappoint many NZF voters who cast their ballots for change, but Peters went against an even stronger mood for change among his core supporters back in 1996. 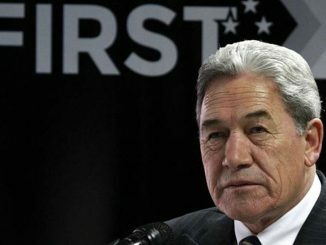 One of the advantages of a mere confidence and supply deal is that – given this is Peters’ last term in Parliament – the succession battle between Ron Mark and Shane Jones would have more room to be fought on merit if the NZF team wasn’t locked into collective Cabinet responsibility. Moreover, given that National is likely to be defeated in 2020, does NZF really want to formally link its fortunes to this sinking ship over the next three years? A cross benches position would leave NZF better placed to work with what is likely to be a multi-term Labour/Greens government from 2020 onwards. But clearly, all of this is just wild speculation. Come October 12, the master will be ready to unveil his conclusions. Which Christie mystery will it most resemble? Peril at End House (1932)? Cards On The Table (1936)? Or Cat Among the Pigeons (1959)? Certainly, the role of always being the kingmaker, the unveiler, the only person in the room who gets to make the crucial revelations… well, that task can be both tiring and tiresome. Eventually, Agatha Christie came to find the whole charade very, very annoying. Late in life, she once described M. Poirot as being a “detestable, bombastic, tiresome, ego-centric little creep”. But then she added, the public still seemed to love him, regardless. We know the feeling. Over the next three years we’re going to see a whole lot more of Winston Peters, whatever path he has chosen for us by this time next week. Reportedly, Rex Tillerson accepted the White House invitation to become Secretary of State only because his wife convinced him that God wanted him for the job. Evidently, God has quite the sense of humour, and I’m not sure He’s still on speaking terms with Mrs Tillerson. If Tillerson really did call US President Donald Trump a ‘moron’ back in July, Trump hasn’t done much to lift anyone’s evaluation of his IQ since then. Going to Puerto Rico and telling the people they weren’t really suffering from a real catastrophe like Katrina, was evil/dumb. Dissing the local mayor for not doing enough (even though she’d been wading through floodwaters for the previous 24 hours co-ordinating disaster relief while you were playing golf) was also a tad insensitive. Rex Tillerson now has some decisions to make, and God seems to be less of a guide, and more of an Unreliable Narrator. Frankly, I’d have thought the offer of a fancy job with illusions of great power sounded more like Satan’s modus operandi. Has Rex been working for the Good Guy or the Bad Guy? Either way, he has some pressing decisions to make in order to save his reputation, let alone his immortal soul. In the meantime, this site for people wishing to confess their unpopular opinion is a lot of fun. And here’s the blues that Townes wrote for the Big Country. In this video, the music has been married to some appropriate images by Richard Avedon….